Passed away peacefully, aged 62 years. Loved daughter of Audrey (dec) and Graham. Loving Sister of Keith (dec). 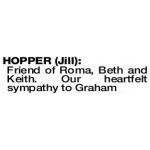 The Funeral Service for Jill Hopper, formerly of Spearwood will be held in Leanne O'Dea's Chapel, cnr South and Ethelwyn St's, Hilton commencing at 10.30am on THURSDAY morning (04.04.2019). A Private Cremation will take place a later time.